I love cURL. Systems engineers, developers, administrators, QA engineers and web operations specialist everywhere have used the curl tool to help troubleshoot web server responses. It gives a quick view into exactly what is being sent from a web server to a browser. On a commute home from work I started to think how handy it would be if the small computer I was holding, my iPhone, had a simple to use app like curl to do the same troubleshooting. I always wanted to write my own iPhone app so I started researching how I could do that. I fired up Xcode on my Snow Leopard equipped MacBook Pro for the first time. I found a few great iOS development books on SafariOnline and started learning Objective-C. After a few chapters I started going off the page and adding views and controllers. I wanted to deploy my test apps to my iPhone so that required that I sign up as an Apple Developer (and $100!). I soon discovered that my Xcode version was too out of date to work with my iOS 6.1 devices so I attempted to upgrade, only to discover that I needed to upgrade my OS. Now on to Xcode 4.6 and suddenly my projects were running on my iPhone and iPad. export CFLAGS="-arch armv7 -arch armv7s -pipe -Os -gdwarf-2 -isysroot /Applications/Xcode.app/Contents/Developer/Platforms/iPhoneOS.platform/Developer/SDKs/iPhoneOS6.1.sdk"
export LDFLAGS="-arch armv7 -arch armv7s -isysroot /Applications/Xcode.app/Contents/Developer/Platforms/iPhoneOS.platform/Developer/SDKs/iPhoneOS6.1.sdk"
I added the libcurl.a library to my Xcode project and started using the easy interface API via CURLcode curl_easy_perform(CURL * handle ). The realtime feel of iCurlHTTP comes from the use of the CURLOPT_WRITEFUNCTION option to push realtime code into a view controller method that renders to the textview object. It required periodically having the thread give up time to the mainRunLoop (via message to NSRunLoop) in order to allow the display to render and respond to user events. 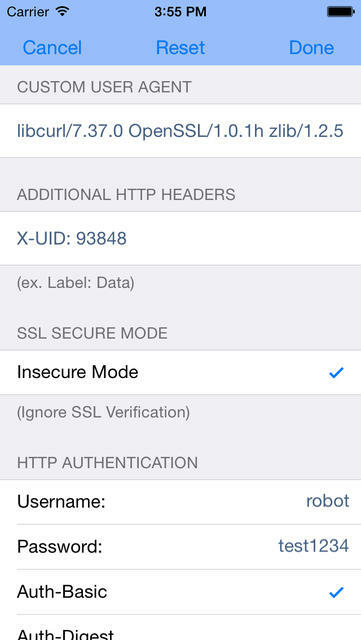 iCurlHTTP was born. 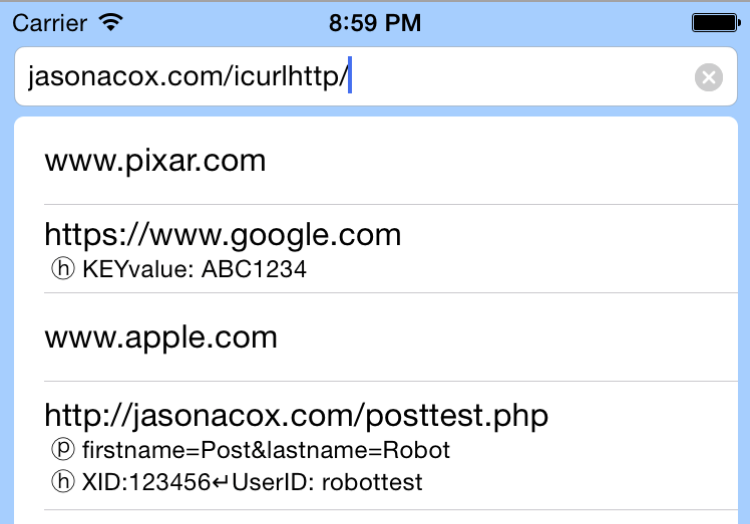 It was a simple, easy to use iOS app that allowed you to run simple cURL like tests, simulating different web browsers to retrive the raw HTTP headers and HTML response from the web servers. I wanted to add this to iCurlHTTP to give a mobile perspective on these numbers. In v1.2, I added this in the detail response view and as timing data points listed along the bottom of the UI. The v1.2 version also includes the iOS 7 SDK updates and the new minimalist UI look and feel. Custom Headers – Allow more and customized browser emulations via a customized option. Print, Copy or Email Output – Add a one-button feature to send the output to the clipboard, printer, email, post, etc. Customized Post – Allow customized post data to simulate a POST form submit. This meant I needed to be able to have a User Settings pop-up screen to allow users to enter custom fields for headers and posts. I also wanted to allow the ability to have a custom user-agent, http authentication (user/password), SSL options and possibly others in the future. I knew I wanted a table based form to allow for formatting, scrolling and auto-positioning. I considered using the Settings bundle but I needed multi-line UITextView input (especially for custom headers). There are several great open source solutions but my favorite version was FXForms, written by Nick Lockwood (https://github.com/jasonacox/FXForms). I used a simple plist for settings persistence. Updates – New libcurl and openssl libraries. 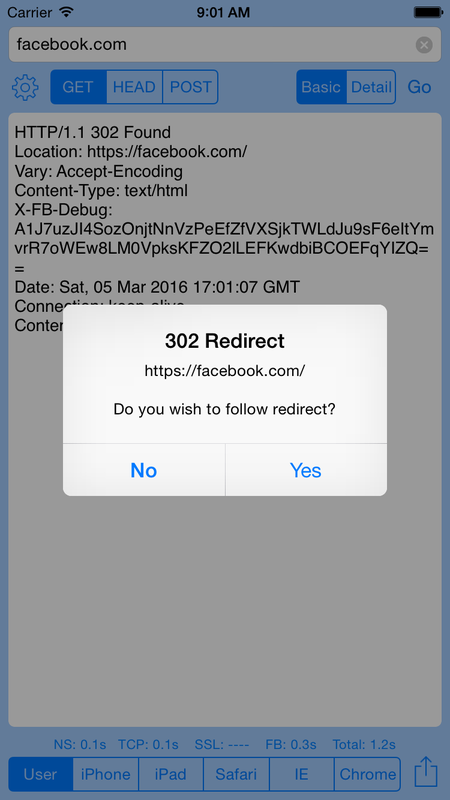 I had several requests to add a “follow redirect” features (similar to curl -L command) to make it easier for users to test. 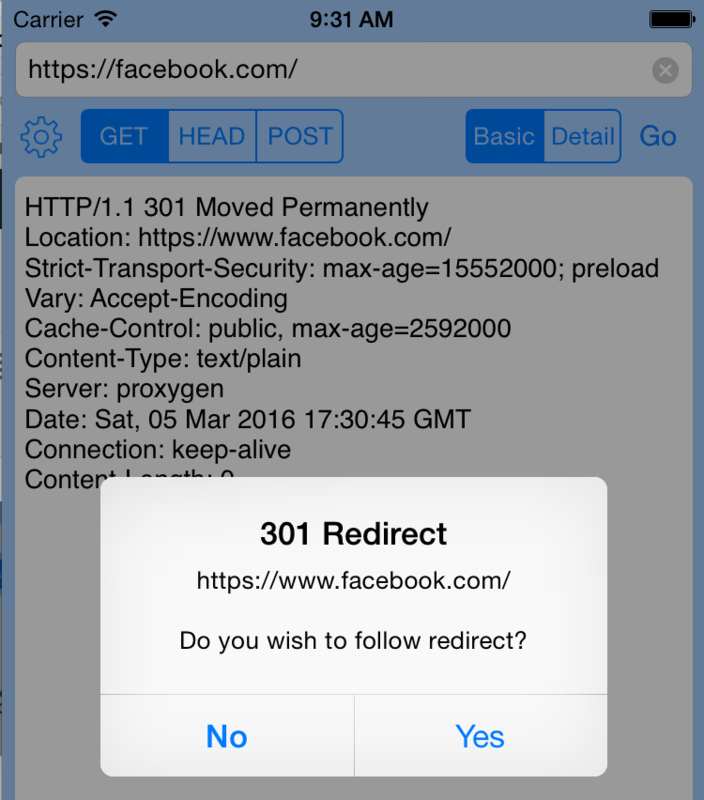 I didn’t want this to be purely automatic because it would defeat the purpose of the granular detail that cURL provides so I present the user with a popup dialog when a 301 or 302 redirect response is received and list the redirection URL they can follow. In this version, I also replace the ugly text “User” (settings) and “Share” buttons with the well known icons to help make it more intuitive. I’m amazed at how this small and simple project continues to grow (both in users as well as feature requests). It has been a fun adventure! I frequently recommend other try building their own apps. iCurlHTTP is written in Objective-C but I would definitely recommend trying out Swift. I’m in the process of porting iCurlHTTP to the Apple TV (seems ridiculous, I know but I have to do it just for fun) and hope to try my hand at Swift. Thanks for your great feedback and support! I really appreciate the kind words and critical advice. Please send more!